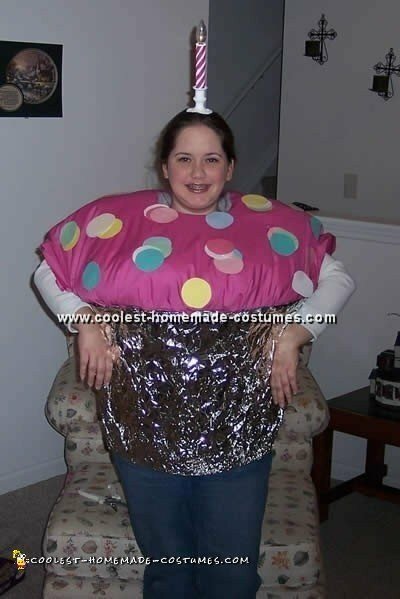 I got the idea for this homemade Halloween costume from a bubble bath costume that I had seen years ago. All I did was take a plastic planting pot which I got at Wal-Mart. I measured myself around my waist and then measured inside the planter and cut out the appropriate size from the bottom so I could stand inside it and have it rest on my hips. I had to ask a neighbor to help me cut off the bottom (since it was considered to be too dangerous with an electric saw). Anyway after my assistant cut off the bottom I spray painted it white with cheap spray paint. Then I bought yellow tulle and hot glued the outside on to the pot. you have to do the outside first then put the batting in which I got from a fabric store. Then put the batting inside the tulle then hot glue the tulle to the inside of the pot. But be careful of your fingers, I had burns on the tips of all my fingers from the hot glue melting through the tulle hence the pink mittens. I then hot glued circular pieces of felt for sprinkles! To finish off I used white headbands and hot glued a small cylinder of Styrofoam on to the headband then hot glued flames that I cut out of felt on to the top of the Styrofoam. This project definitely wasn’t easy but the burns and blisters were worth it when we were the hit of every party that we went to as cupcakes for the rest of the year! 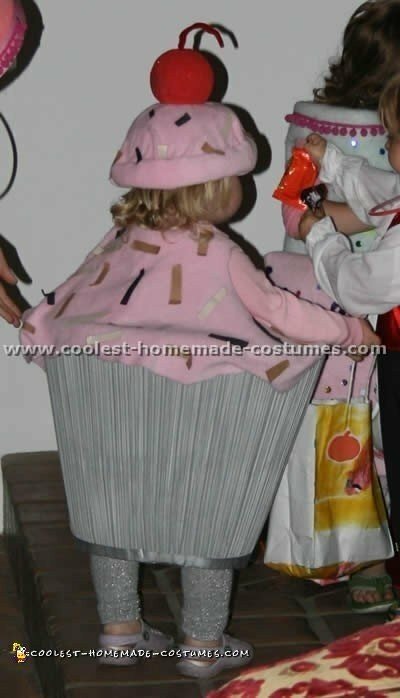 My four year old and two year old went as cupcake and a birthday cake. 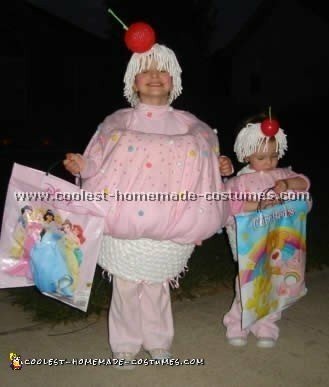 I always make them a homemade Halloween costume and this was so easy! We started with a clearance white lampshade from a craft store and cut out the wire from the top. This allowed a walking flexibility for when we turned it over. We used kitchen masking tape to “seam the bottom” and spray painted it silver. Then, we added fabric suspenders to hold it up with small tabs of Velcro on both the top of the shirt she wore and the suspenders to prevent the sides from slipping down. We also added silver tights to continue the look. For the frosting it is simply a fleece “shawl” made with arm holes and construction paper sprinkles. The trick for us was to put Velcro strips on the outside of the lampshade top and inside of the frosting shawl bottom so that she wouldn’t have to be stuffed with extra material to keep it tented. We also put Velcro on the back so that it should be easily removed for Halloween parties. If I did it again (for a two year old) I would have made the bottom a little shorter (additional cut on the lampshade) because some of the high steps were hard for her to get up by herself. The hat was leftover frosting fleece spray glued onto on old winter hat and a painted Styrofoam ball for the cherry with a pipe cleaner in the top. The birthday cake was made from another suggestion of using foam for layers. We just spray glued batting onto the foam and cut arm holes to slip through. Then, we put Velcro on the two ends to hold it in place while walking around. We went to about four or five Halloween activities and did have to replace the Velcro once. The best thing about this costume was that my four year old helped to decorate it. Not the most perfect decorating but she loved telling everyone how she made her own homemade Halloween costume! Just sequins and ribbon for the outside. The hat was made with the extra foam and an empty toilet paper roll was the candle with a tissue paper flame. 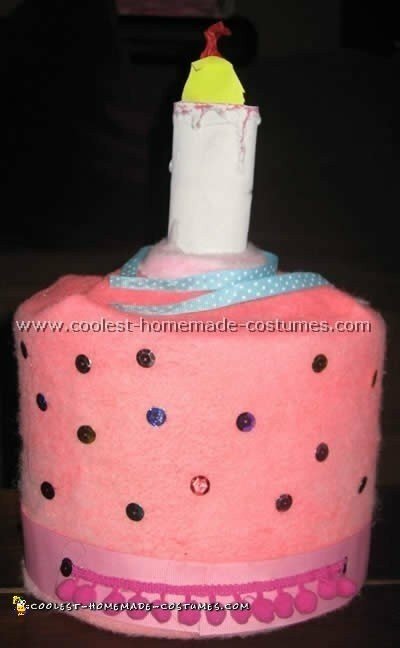 The bottom layer was covered in the “leftover” fleece from the cupcake costume we also made. Any fabric spray paint would work for any colors. One craft store got everything we needed and no extra running around! I made this homemade Halloween costume for both of my daughters. I call them both “cupcake” so the idea came easy. I got most of the stuff I needed at a Dollar store. First I cut the top off one basket and cut the center out of both bottoms of the baskets. Then cut the bottom on both baskets (this will help get in and out of the costume). I wrapped the fabric on the basket that you cut the top off (this is the bottom of the cupcake) gluing along the sides top and bottom. And remember to wrap around the hole that was cut out. Place the fabric for the top of the cupcake over the entire basket and cut it into a large circle, bigger than the basket so that when you glue it on there is some overhanging. (So it looks like drippy icing). While gluing on the “icing” leave a couple of spots so you can place the Polly fill along the inside to make it puffy. Cut away places for arm holes from the inside of the top basket and cut a slit through the fabric big enough for the arms. I found out that the closer toward the front the better. Hot glue the top and bottom baskets together and decorate to your liking. For the cherry on top paint a foam ball and a stick from your backyard. Insert the stick into the ball and glue it to a head band. Decorate the head band (I used the edging from a Chenille throw). All I did for make up was some pink blush for their cheeks. 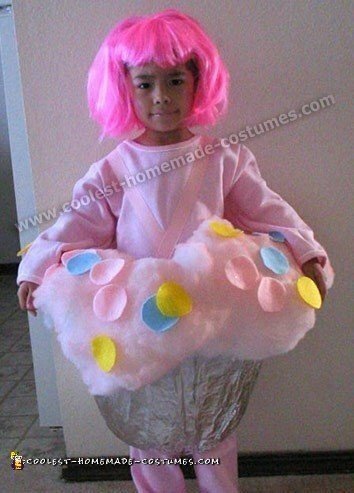 I hope this homemade Halloween costume idea works out for you as well as it did for us. We won two costume contests and got tons of compliments. 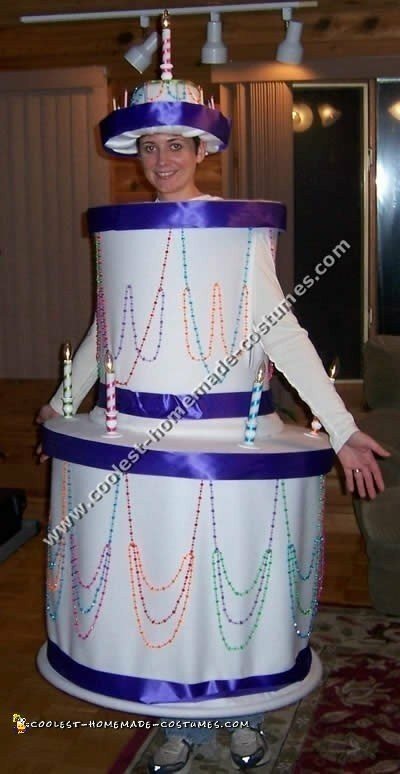 This year I decided to be a birthday cake! It was an appropriate costume for me since it was my birthday on the 27th and I was headed to a Halloween party – so why not! I created a three layer cake – a play on a mad hatter cake design. This was constructed out of a lot of felt (white for the layers, pink and orange for decorations) a wire wreath frame, three hula hoops, battery operated tea light, candles, a birthday candle, headband and a wrapped present box. I picked up almost all of my supplies at JoAnn fabrics while stuff was on sale so it only cost about $55 for the entire thing. The costume itself was collapsible so I could actually sit and function while walking around. 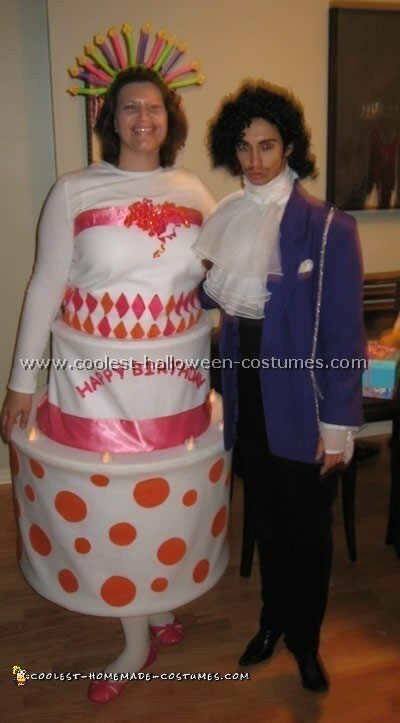 It was so much fun to wear this and people just could not believe that it was a homemade Halloween costume. I completed the outfit with coordinating shoes and white stockings. I had a great time making this and wearing it! 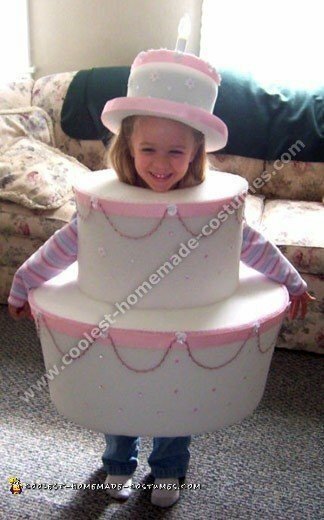 I had a homemade costume idea, a birthday cake, for Halloween. Made out of four hula hoops, white fleece fabric, some cardboard to split and hold the layers and battery operated candles. I used ribbon and cheap kiddy party necklaces to decorate. The costume could collapse down flat for easy transportation. All in all it took about 10 hours of work. This idea of our homemade Halloween costume comes from my cousin-in-law. 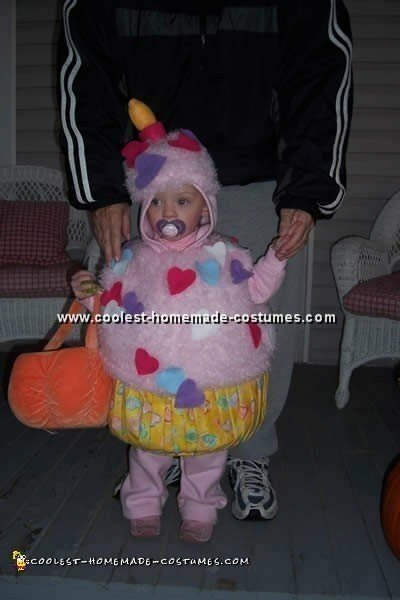 She thought it would be creative for my little girl who is 19 months old to be a cupcake. I used chicken wire and duct tape to make the bottom base. Then, I wrapped craft batting around the chicken wire and took a yard of material, folding it about every 2 inches to make it look like a paper cup. I took a yard of fluffy fabric, cut it into sections and sewed it together. I was able to make the round top with that. Next, I took felt and formed a vest so that it would fit close to my daughter’s body and allow the bottom to be stitched to the top. After the vest was attached to the bottom I took the fluffy material and attached it over the felt vest and onto the bottom form by stitching it on. I then added some poly-fill in between the vest and fluffy fabric to form the puff of the cupcake. I stitched the fluffy fabric to the vest allowing it to be fuller on bottom and finished with hot gluing felt hearts all round for the sprinkles. With some of the left over fluff material I made a stocking cap by following the same technique to form the body and attached 1/2 inch elastic. I made a candle out of left over felt and toilet paper roll. Closed the top of the hat by stitching the candle to it and again glued felt hearts to the hat. That was it! Sounds like a lot of work but it really wasn’t. This homemade Halloween costume took us about a day and a half to complete. Costume by Joyce B., Oklahoma City, OK. I made this homemade halloween costume out of a laundry basket wrapped in foil. I used pink ribbon as suspenders. Then, I hot glued cotton filler all around the top of the basket. Next, I spray painted it pink and hot glued pieces of colored felt I cut out. In addition, I also made her a candle head piece (not pictured) for her homemade Halloween costume. I made it with two headbands I binded together with pink ribbon and I made a candle with a paper towel roll. To make that I glued a piece of red construction paper on the roll (first I put some foil to cover the top, then the paper around the side). Then I used the hot glue gun to make it look like wax dripping down the side and I put red glitter on the top and the faux wax dripping. I made a flame out of some leftover felt, glued it to a tooth pick and poked it through the foil on top. My 4 year old wanted to be a birthday cake. 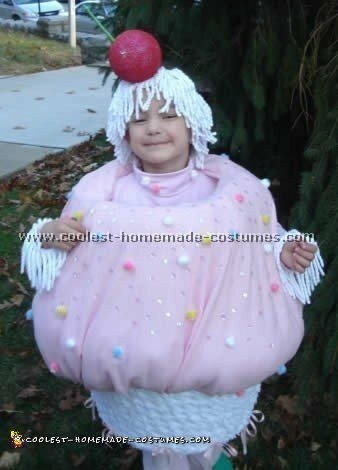 We wanted this to be a soft and comfortable homemade Halloween costume so I used 1/2″ thick foam. Cardboard was sandwiched in between layers of foam for the top portion of the tiers for stability. Everything was hot glued together and I hand-stitched in a few spots to make sure all would hold together. We decorated the costume with discounted trimmings found at our local fabric store. A battery-operated Christmas candle was glued into the hat. This homemade Halloween costume took 6 hours to make but was a lot of fun! I cut the bottom of a storage tub out. Then, I glued cardboard to the top of it and glued polly-fill to that. I let the cardboard hang over the edge of the tub so that it looks like I have a lot of icing on it. In order to make it easy to wear, I attached two elastic straps to the cardboard. I covered the polly-fill with the cloth to look like icing. I tucked it under the cardboard and glued it down. Next, I wrapped the tub in one box of heavy duty tin foil. I made sure I had enough at the top so it would stick out like a real foil cupcake holder. I cut out circles of construction paper and glued them on for sprinkels. My candle is a battery powered light glued to a headband. I painted it and let it dry. Then I painted the white stripes on it. This homemade Halloween costume is very comfortable to wear but I need help getting it off.